More schools are taking two week breaks over the holidays in the 2019-2020 school year, so the week after New Years in 2020 has many kids still on break. Thus I expect Disney World to be heavily crowded through January 5, 2020. 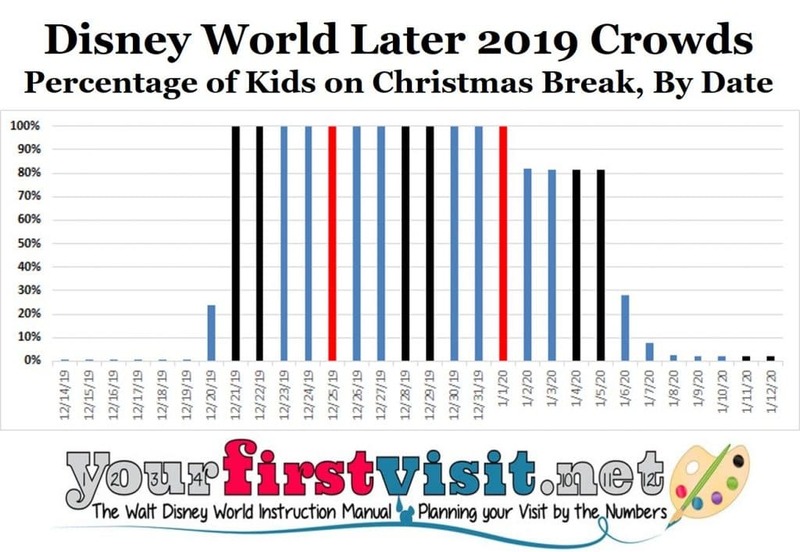 As a result, the period Christmas-New Years is always mobbed at Disney World, as everyone is out of school then, but the periods before and after vary from year to year depending on what day of the week Christmas falls. In 2019, the Wednesday Christmas makes the choice for long-break districts pretty straightforward. All of them are off at least Saturday December 21, 2019 through Sunday January 5, 2020. A tiny number of kids start their breaks on 12/14/2019, and a larger number has Friday December 20 off. Many schools have teacher workdays and/or holiday extensions on Monday January 6, 2020 and some even Tuesday January 7. A tiny number of kids have breaks extending through Sunday January 12. Schools with shorter breaks typically are off December 21, 2019 through January 1, 2020. Following the trends of past years, fewer kids have shorter breaks and more have longer breaks. As always this time of year, it is critical through December 19 to visit the right park on the right day, and this will be especially true the week beginning 12/14. Pick the right days to be in each park, and you will see moderate-minus crowds; pick the wrong days, and you will see high crowds. It’s based on data from a weighted sample including more than 250 of the largest relevant US public school districts with more than a quarter–13.7 million–of total US school kids included. The holidays are red, the weekends black, and weekdays blue. You can see that breaks begin Saturday the 14th. A few more kids go on break beginning the 19th, many more Friday the 20th, and by the 21st everyone is on break. Pretty much everybody stays out of school through January 1, 2020, and while many go back to school January 2, more than 80% of US schoolkids remain on break through January 5, 2020. Many are still on break January 6, some January 7, and a small number are on break through January 12. Kelly, the long-time travel agent partner of this site, can help you book your Walt Disney World vacation–during your 2019 Christmas break, or another time! Contact her using the form below.